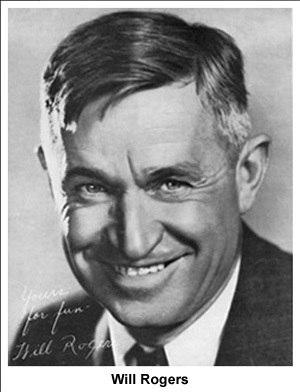 The above quote is from Will Rogers in 1934. Known worldwide as a humorist, a social commentator, performer and motion picture actor, he was one of the best known American’s of that decade. The best paid actor in Hollywood, making 71 movies. He traveled around the world three times; and, as a syndicated columnist, he wrote more than 4,000 columns.